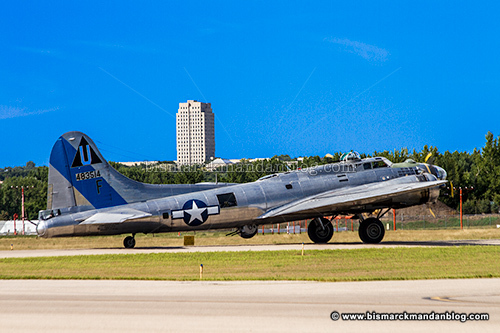 I posted earlier about the visit by Sentimental Journey, one of the few airworthy B-17 bombers that remain. I didn’t do the $5 walkthrough again this year, although it was definitely worth the money. I did, however, do a couple of cool things. One of the things was to shoot some video of them firing up the engines. Because engines like this are prone to leaking certain fluids, someone stands by with a fire extinguisher and gives a thumbs-up to the pilot once each engine has safely spun up. They start with engine #3 because it’s near the battery and gets the best crank, and work their way around the aircraft from there. My little boy thought it was pretty cool. The other cool thing was to park out on the northwest end of the runway and let the rumbling beast roar right over our heads. My little guys thought this was a really sweet deal. 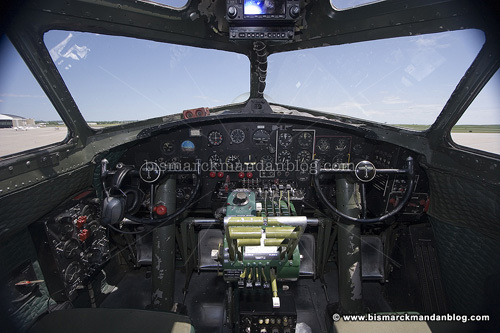 Scroll down a little bit if you want to see my interior shots of this piece of military aviation history. Check out the video above if you haven’t already. If you missed this aircraft, hope it comes by again in a few more years. More information is available online by clicking here. 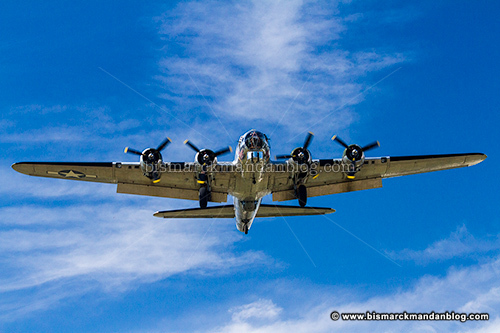 According to the Tribune, “Sentimental Journey” will visit Bismarck this Thursday through Sunday. 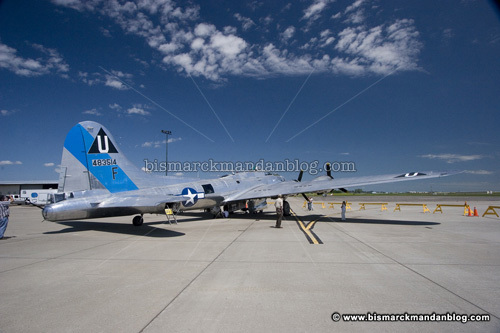 It’s a B-17 bomber available for five dollar tours and $425 rides, and it’s worth visiting. I’ve had the opportunity to check out this plane from head to toe, and here’s a preview. 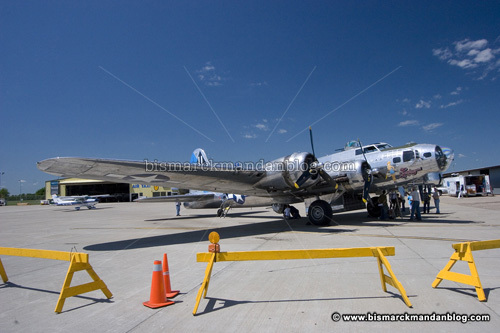 I took some time a few years ago to visit the B-17 bomber that was parked near Executive Air for the better part of the work week. It’s cool to see such a piece of history, especially since it’s a piece of technology and military hardware at the same time. It wouldn’t be a truly nostalgic WW2 era plane without some 1930’s – shaped woman painted on the side (Betty Grable in this case). I couldn’t help but think of the old 1980s video game “B-17 Bomber” on the Mattel Intellivision game console. A friend of mine had that game and the expensive Speech Synthesis module, which allowed many of its games to “talk. B-17 Bomber was one such game. Thanks to the Internet, you can listen to the introductory sound from that game by clicking here (mp3 format). What a big machine, don’t you think? When the news of possible hail or a tornado came in last night, this plane was moved into the BP hangar on site. It barely fit; it had to be rolled in by hand, with four guys on each wheel to move its weight, and its gun almost touched the hangar doors once closed. 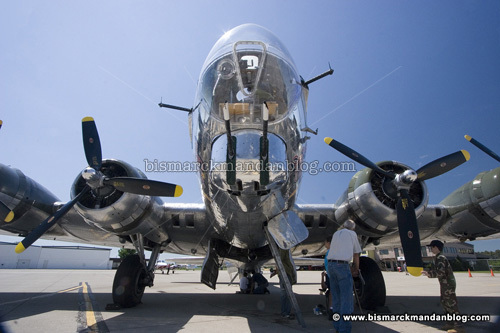 There were “little planes” tucked under each wing as well, but the mighty Flying Fortress fit. Say that three times fast. 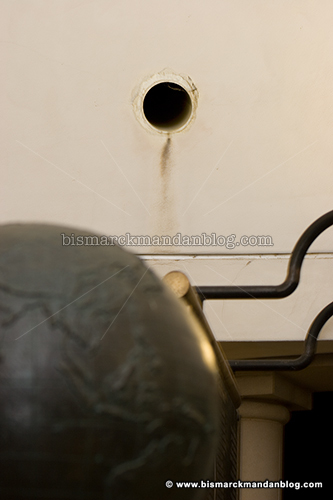 This is the forward gun turret. Note the picture of someone’s lady on the left side wall. This would be a pretty crazy place to be when the fighting got hectic! I can’t even imagine. I think the fella who did the calculations for the bomb trajectories was located up here as well as the forward gunners. 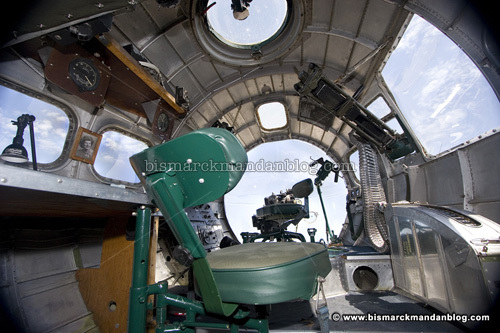 This is the cockpit, one of the few places with windows that don’t have a gun sticking out of them. It must be a challenge to taxi a “tail-dragger” aircraft like this one…in fact, a friend of mine was near an accident at Oshkosh a few years ago where a little plane cut in front of a big plane on the tarmac. The propeller of the big plane sliced right through the little one. Messy. The pilots of planes like this have to zig-zag when they taxi so they can look out the side windows; the front windows point at the sky until they take off. 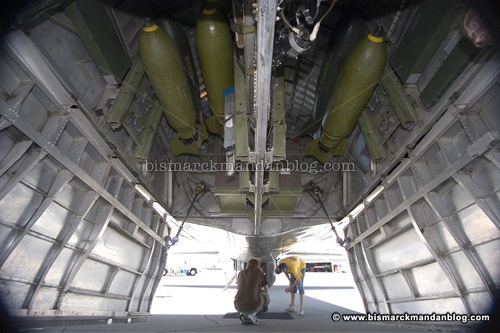 The bomb bay with doors open. That rail down the middle is the “walkway” for the plane’s crew. It’s about six inches wide. I had fun sneaking through there with my camera bag! It would be best to be skinny to be on a B-17 crew. I had that part covered, but then I decided to lug my gear with me. I would have thought there’d be more bomb space and less crew space, but I really don’t know much about aircraft. 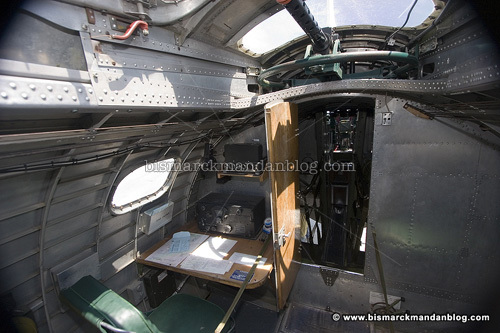 Here you can see side guns as well as bunks for crew members, who I suppose rotated resting periods. 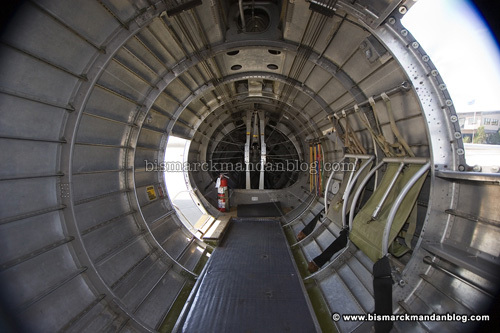 This photo is somewhat out of sequence as it was taken from the rear of the aircraft, facing forward. Firepower. 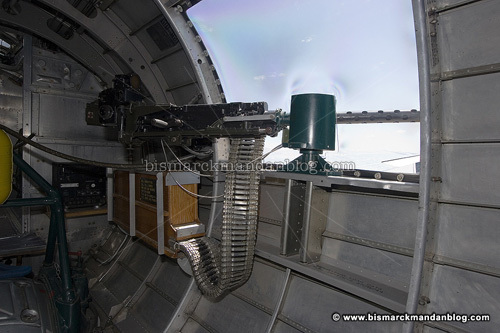 The guys manning these guns were responsible for keeping this aircraft safe from enemy fighters. 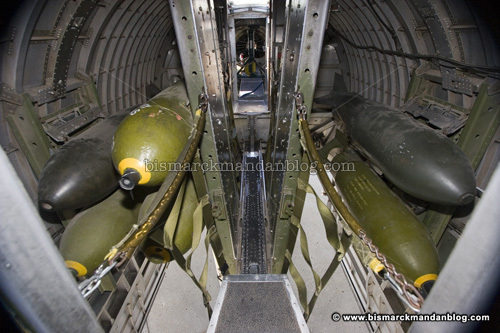 To do so requires some big guns, and there are big guns all over the B-17. 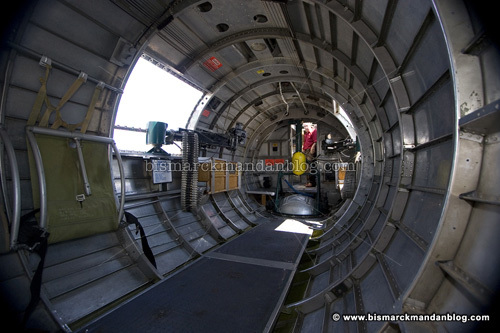 For $425 or so, you can take a ride on this plane, and even sit up in the nose turret. For $425, I think they should make these guns operational. Now that would be worth running to an ATM! The aforementioned bunks. 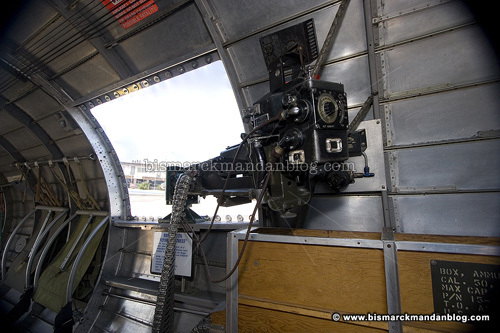 At the end of the fuselage is where the rear landing gear is stowed, and of course another gun position. Thus endeth the tour. This was truly an amazing way to spend my lunch hour. It’s one thing to leisurely poke around this aircraft, looking at the old technology and trying to grasp a bit of history. It would have been another world entirely to dodge German or Japanese AA fire, fend off enemy fighters from a gun turret, and hopefully make it to the intended target and back safely. Oh yeah, and deliver the bomb payload on target. The people who fight for our country are incredible, but I think of World War Two stories and am in total awe. 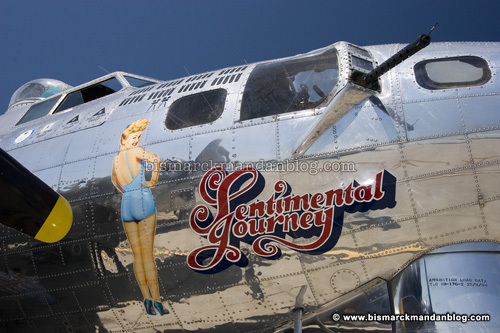 “Sentimental Journey” will be in town from Thursday through Sunday. For more information or to reserve a flight, visit www.azcaf.org. 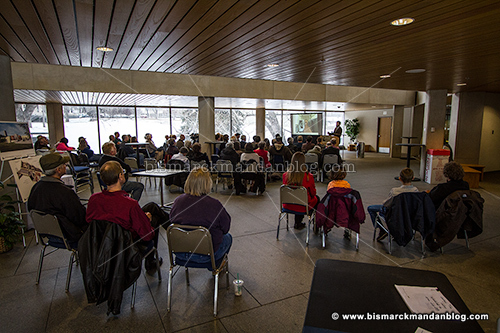 The most usable space in the Heritage Center was the setting for a very interesting presentation this weekend: the effect of the Cold War and military infrastructure on the landscape and culture of North Dakota. 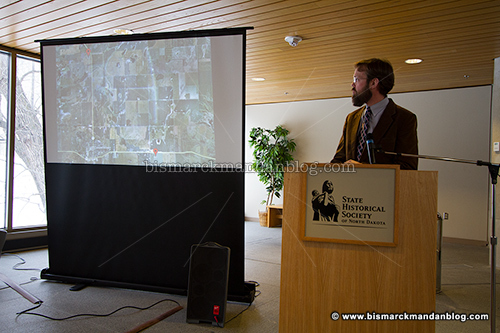 It was an extremely well-attended session, to say the least…one of three sessions planned to highlight North Dakota historic sites and their importance. 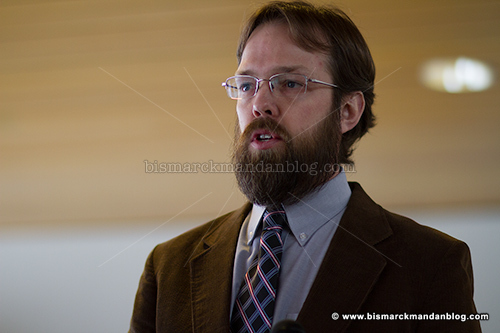 Site director Mark Sundlov, a former member of a Minot Air Force base missile crew himself, was the presenter. He has a unique perspective on this subject and is determined to help preserve this important part of North Dakota’s (and our nation’s) history. Right now it’s ripe for the picking, as there are many anecdotes to record. The audience had plenty of their own. The interest in this subject as well as the gold mine of information and firsthand accounts was a strong affirmation of just how spot-on Mr. Sundlov is about the impact of the military and this period of history on the culture of North Dakota and the everyday lifestyle of its citizens. I strongly recommend clicking on this link to listen to a podcast interview with Mr. Sundlov from a while back, before the Ronald Reagan Minuteman Missile Historic Site was even a reality. In it he talks about life on a missile crew, something that wasn’t really part of the focus of Sunday’s presentation. Let’s not forget that Memorial Day is about one thing: honoring fallen heroes who died defending our freedom. 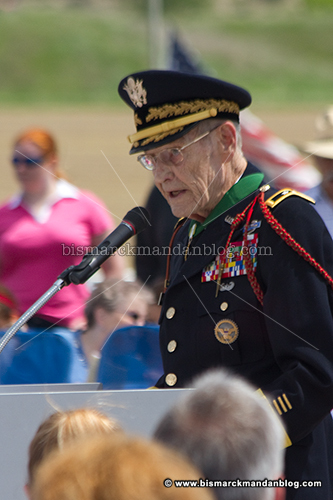 I typically attend the ceremony held for such purpose at the Veterans’ Memorial Cemetery each year, the most memorable of which was in 2010. 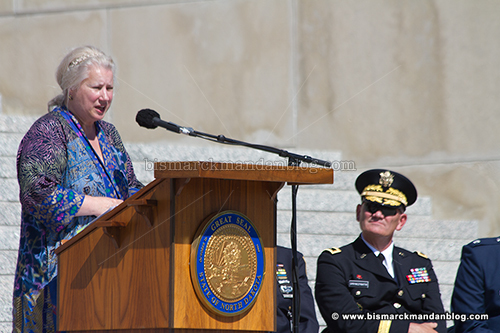 It was during that ceremony that I witnessed a stirring address by C. Emerson Murry, former Major General of the ND National Guard. He was the keynote speaker of the event, and a very memorable one at that. The words that struck me the most from his keynote address are best paraphrased as follows: “To be born free is an accident. To live free is a responsibility. To die free is an absolute obligation.” That made me set my camera in the grass and hastily type it into my phone so I wouldn’t forget it. 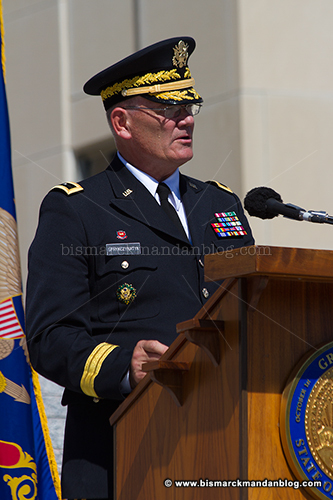 Maj Gen Murry fulfilled that obligation, and it’s due to such men and women of our armed forces that we enjoy the freedoms we take for granted. 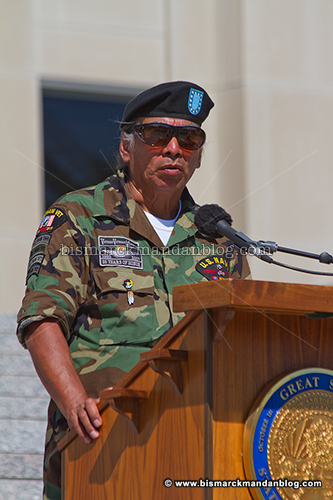 It was the last chance I had to hear him speak; Maj Gen Murry passed away in September of that year. You ought to take the time to read about the life of this remarkable man by clicking here. 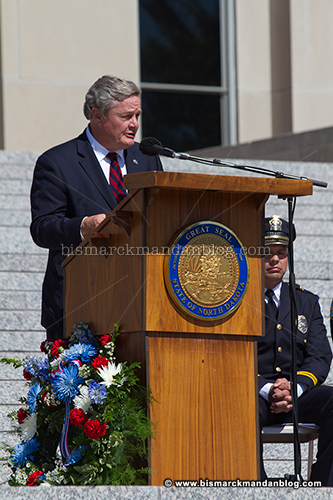 Governor Jack Dalrymple and his wife Betsy hosted the event. 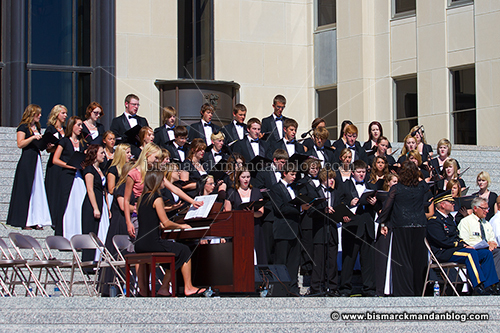 The Mandan High School Concert Choir provided stirring music, with my friend Becca at the piano. 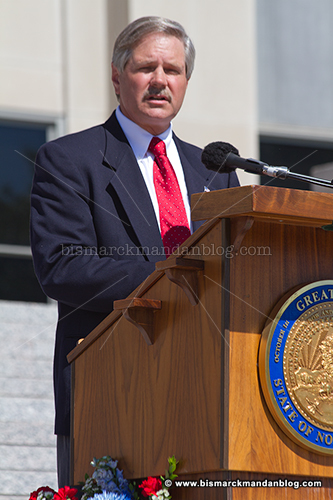 US Senator John Hoeven gave his remarks. 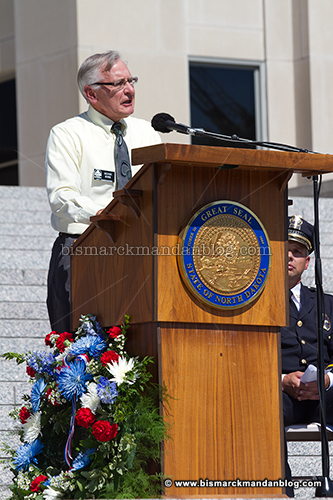 US Congressman Rick Berg also spoke. 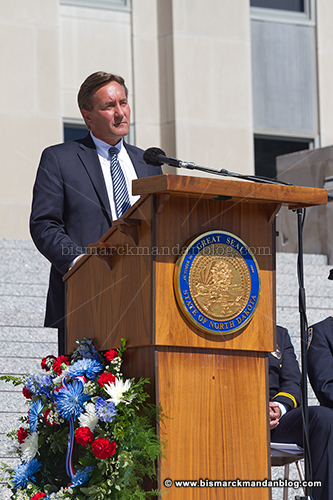 Bismarck City Commissioner Mike Seminary represented the City of Bismarck. 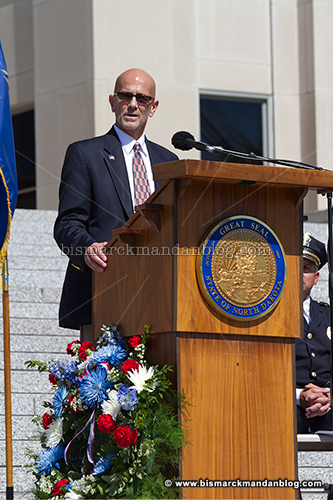 Mandan City Commissioner Dennis Rohr. Of course, I’ll always know him as Chief. 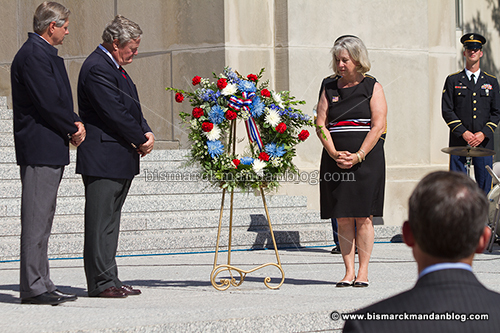 The Governor and First Lady stand with Senator Hoeven during the presentation of a wreath to commemorate the day. Lt. Governor Drew Wrigley is looking on in the foreground. 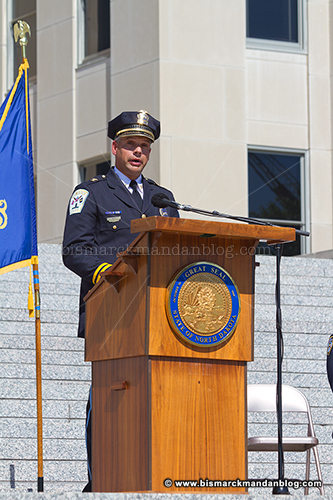 Bismarck Police Chief Keith Witt spoke on behalf of first responders. when he was working at Ground Zero for the NYPD. but also natural disasters here at home. 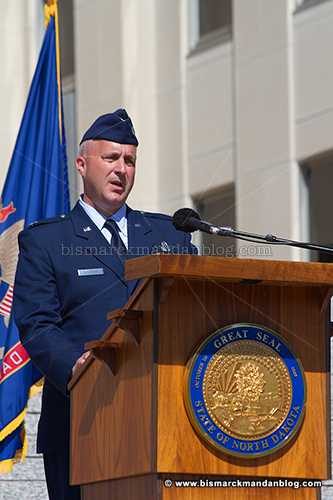 over Washington DC that day with the NDNG Happy Hooligans. Jenette Nelson spoke of the loss of her daughter and how her memory lives on. 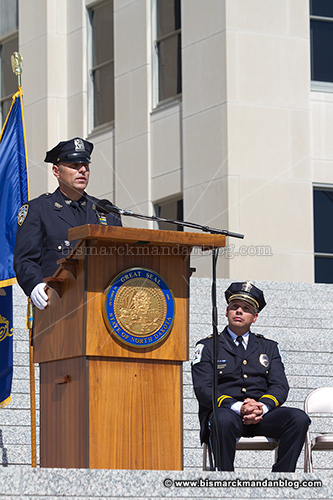 Paul Goodiron gave perhaps the most stirring speech of the day, honoring not only those who serve but also the families who serve with them and endure their loss. 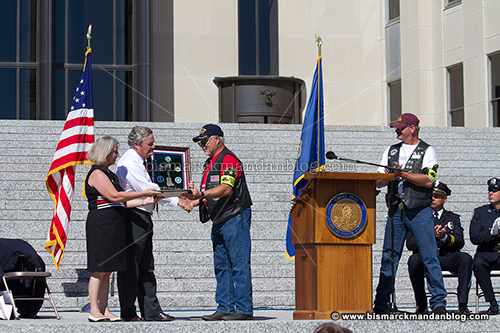 The Patriot Guard Riders had a presentation of their own to the office of the Governor. 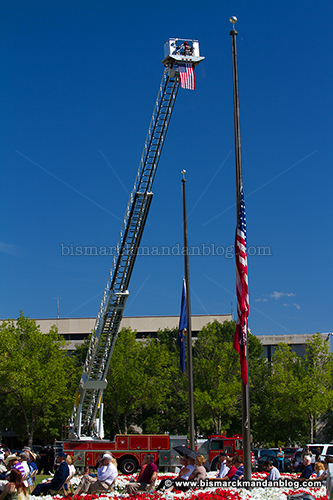 First responders from fire, ambulance, and local law enforcement were in attendance to commemorate the day as well. I got to hang out with one of my favorite law enforcement friends and take photos. 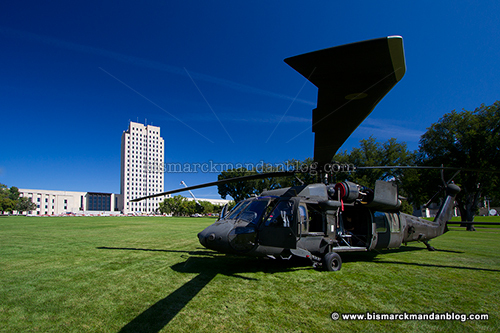 One popular part of the day was a Blackhawk helicopter on the capitol mall, available for all to see. Its crew were on hand to answer questions and explain the operation of the aircraft. Then it was time to go home, tribute given and memories shared. “We will not waver; we will not falter; and we will not fail. It’s just a shame that very few people will ever see this rock; I stumbled upon it by accident while out getting the truck dirty. 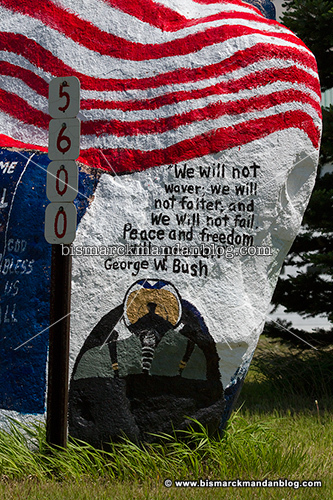 Can you imagine the heartfelt pride in our soldiers the artist must have felt as they painted this tribute to their sacrifice? It’s very moving and I had to tell you about it. At the bottom of this post I’ll give you directions on how to find it; it’s not that hard, really. 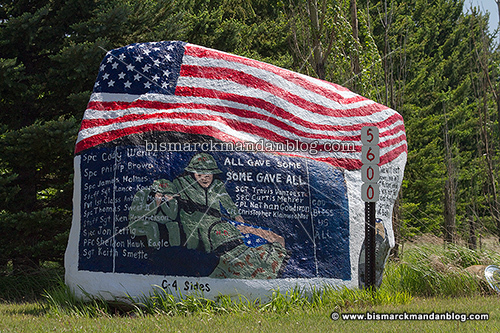 View Bismarck-Mandan Blog in a larger mapToday is a day of great pride in our nation and its armed forces, but we shouldn’t let that pride wane on any other day. Landmarks like this one are a great reminder of that. Pay it a visit! When the 321st Missile Wing was deactivated, its silos were imploded, communications lines cut, and underground launch control facilities filled. 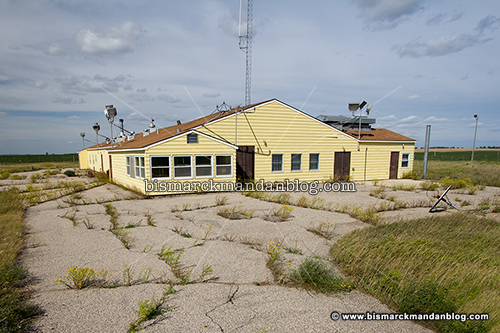 The above ground portion of its facilities were turned over to private landowners. I’ve visited many of these, and sadly many are in a state of decay. Then there’s this one. 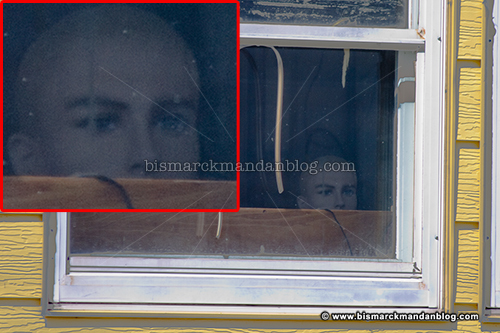 Thankfully one of the lenses I carry is a long telephoto, which allowed me to see what the spooky shape was: a manikin! Boo! The sight of that head just barely peeking over the counter is probably spooky enough to dissuade any potential trespassers…especially since it reminds me of that bald chick from the first Star Trek movie. 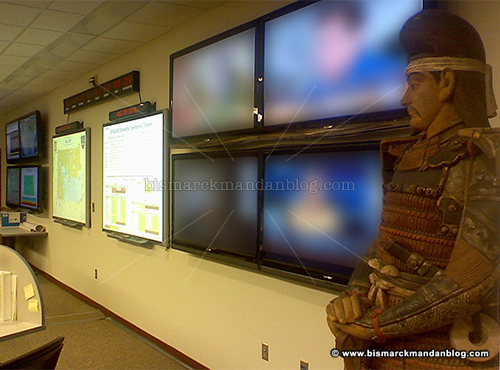 While working in the Joint Operations Center a while back I couldn’t help but notice the large wooden Samurai standing in the far corner next to the monitors. Once we wrapped up I was given permission to take a couple of quick cell phone pics so I could do some background checking later. This particular statue is very important. The Samurai portrayed here is Kusunoki Masashige, a warrior who was a legend and an inspiration to Kamikaze pilots during World War II. 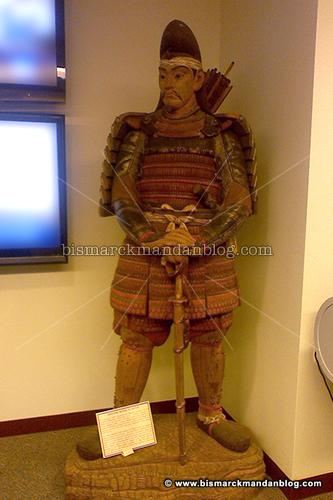 This particular statue originally stood in a Tokyo military school and was claimed by a North Dakota unit, the 164h Infantry Regiment, as a war souvenir. Given to the State Historical Society, it spent nearly forty years in their care and adorned the Liberty Memorial building on the capitol grounds. In 1986 it returned to the National Guard and now sits in a very high-tech setting at the JOC, one suitable for such a revered warrior. I didn’t think I’d make it to the memorial at the capitol today, but I did. I had plenty of company. Showing up twenty minutes early turned out to be a pretty good plan, as it really packed in with people (including a LOT of kids) waiting to see the phenomenon! 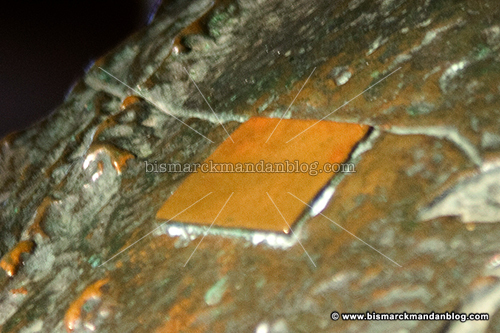 This is the circular beam of light which is cast by the sun thanks to a tube in the side of the memorial (see the post immediately below this one). 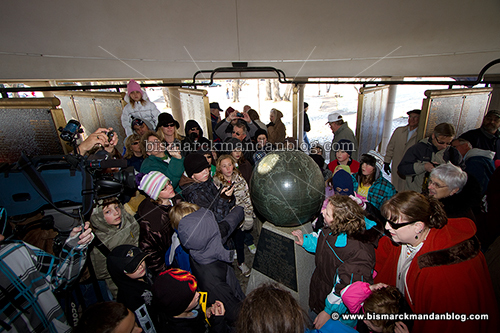 At 11:00 it is centered on North Dakota, which is a raised and somewhat polished portion of brass on the globe in the monument’s center. The globe itself has seen better days. 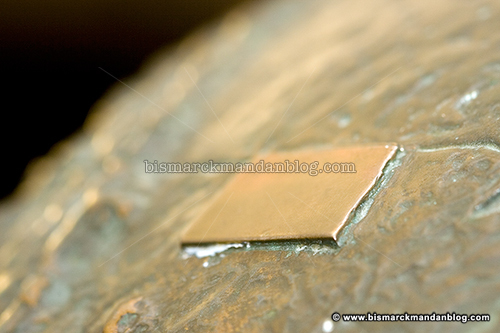 The brass North Dakota is tarnished and needs to be polished & coated. There are also bird droppings on it, something I figured would be corrected before Veterans’ Day arrived. I figured wrong. If a volunteer is needed, I’ll put my name on the list. 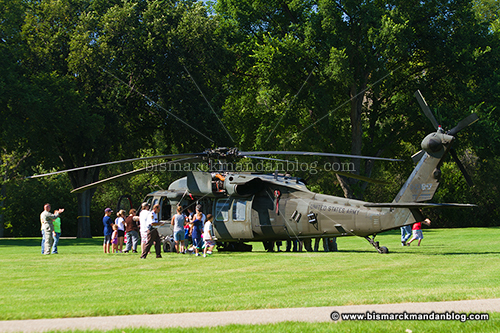 This was a neat event, but let’s not forget that today is about the nation’s soldiers. Please read on to the post below this one for more on that. Thank every veteran and soldier you encounter today! 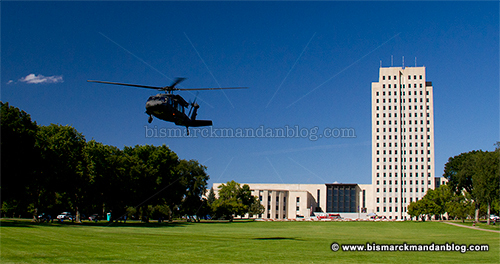 I’m sure many of you will recognize the All Veterans Memorial on the grounds of the North Dakota state capitol. With today being Veterans’ Day, there will be a lot of visitors here. This memorial does something special on this day, although a cloudy day may hamper that a little. So far the forecast has been wrong and the skies are clear, so perhaps all can proceed as planned. 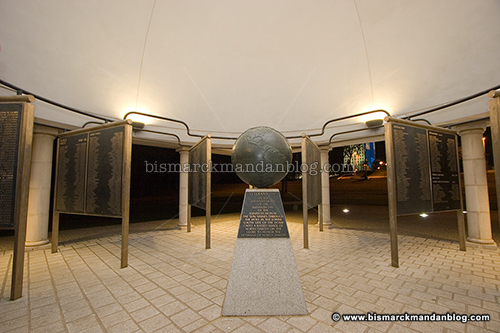 For anyone who doesn’t know, the top of this memorial is only square on the outside; the inside is a spherical dome. That’s important for many reasons, which are evident when you’re there. 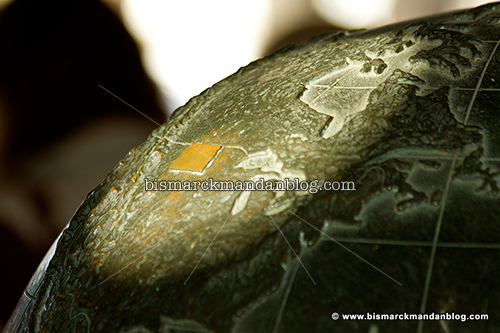 At the center of the monument is a globe on a pedestal. As the placard describes, something special happens here at 11 o’clock on the eleventh hour of the eleventh month every year, in commemoration of Veterans’ Day. 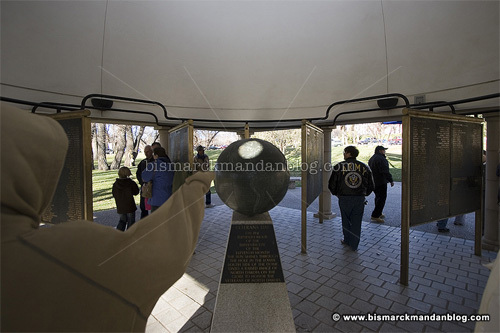 At precisely that time, the rays of the sun travel down this hole in the dome of the monument, beaming their way directly toward the globe at its center. I was kinda hoping that someone would be able to clean that stain off the wall where water sometimes drips through the tunnel. On the globe, North Dakota is raised and polished above the surrounding terrain. The light of the sun strikes it directly for a brief period of time every Veterans’ Day at 11 am, lighting it up for those in attendance. I’m not sure my schedule will allow me to attend today, so I thought I’d share some images of this phenomenon from years past. Judging by the number of people waiting to catch a glimpse of this once-a-year happening, I can see it’s no secret. 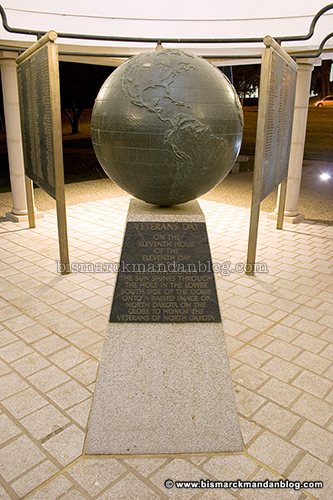 This is the base upon which the globe sits. 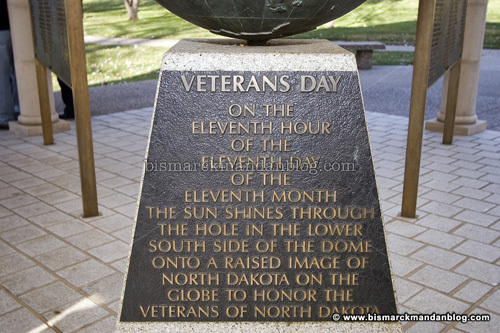 Note that the inscription says “the eleventh hour of the eleventh day.” That’s significant because World War I ended at 11:00 on 11/11/1918. 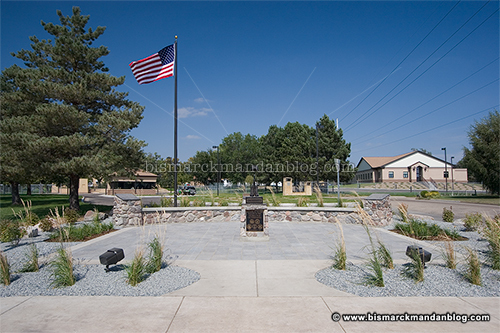 In addition to this memorial and the ones at each end of the new Memorial Bridge, there is also the Global War on Terror Memorial in west Bismarck. Sadly, names have been added to the roster here in 2010 as we continue to stand vigilant against terrorist adversaries. 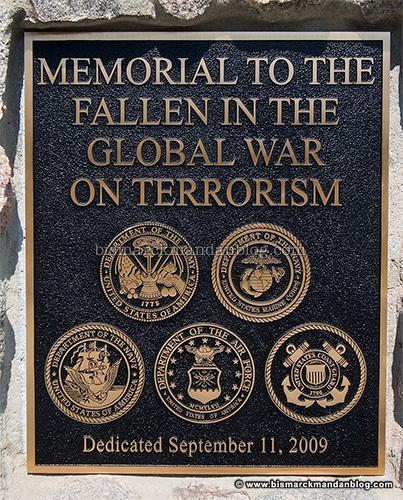 Dedicated on September 11th, this memorial specifically honors those who have sacrificed all in the war on global terrorism. While September 11th is of important significance at this memorial, so too is November 11th. 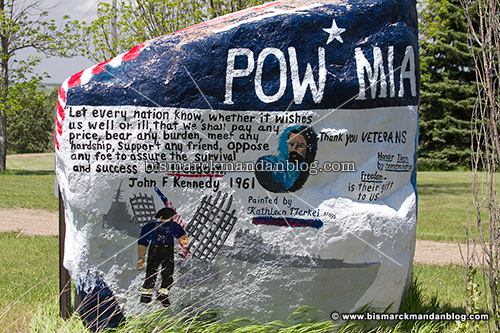 In my opinion we can’t have enough days honoring our soldiers. 365 per year seems about right. Today is about one thing: remembrance of the American soldier. Millions have served this great nation over the past couple hundred years and every one of them sacrificed a great deal, even if they didn’t lose their life or suffer physical injury in battle. 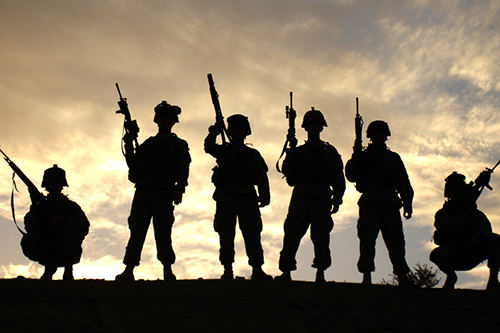 We should hold them in high regard and thank them for the freedoms we enjoy because of their commitment to duty. Regardless of whether the sun appears today these Memorials are always worth a visit. 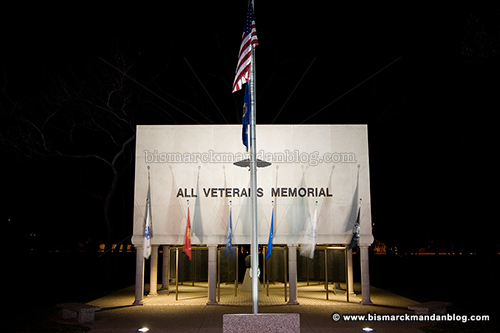 Then take some time to peruse the names on those metal placards and consider the men and women who protect this great nation. I’d like to pass along my personal thanks to all veterans and their families, who sacrifice along with them. Closest to me are my friends Reed and Tony, although I’ve met many others and owe my freedom to millions of ’em. Military service is not something to be taken lightly, and neither is the sacrifice of a soldier’s family. Today’s a good day to take some time and express our thanks.